a. The fig tree in our orchard has never done well, ravaged by one critter after another. Bears can be hard on fruit trees, you know. b. Figs do not keep for long after they ripen which is probably why it is not a popular market crop. When we are fortunate enough to find figs for sale, they are in small baskets with hefty price tags. So given our fig shortage, we came up with this idea for showcasing the figs we do have. Roasting the figs intensifies the flavor. 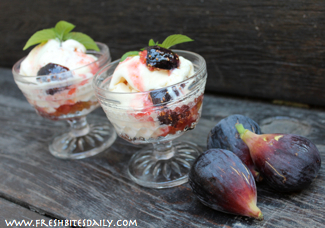 One or two figs per serving offers enough flavor to provide a satisfying fig experience. Besides the flavor, the color is bright and jewel-like, an impressive enough dessert to offer to company. Wash the figs and pat them dry. Cut off the stem ends and quarter the figs long-ways. Heat a heavy skillet large enough to accommodate the figs quarters in a single layer. For best roasting, don’t crowd the figs. Use medium heat. Gently place the fig quarters into the hot buttered skillet. Figs are delicate and you want to keep the quarters as intact as possible for the most visual appeal. Drizzle a little honey over the fig pieces. Figs are already quite sweet so do not overdo this. Use a mild honey so the flavor does not overwhelm the fig flavor. Sprinkle on the lemon juice. Stay with the pan, slowly stirring the figs as they roast. This will take 2-5 minutes depending on the initial size of the figs. Pull the skillet from the heat when a nice sauce has formed in the bottom of the pan. The sauce and figs should be bright and full of color. The sauce will not thicken until it has cooled on the ice cream. Remove the figs and sauce to a bowl for cooling. Let them rest until they reach room temperature before building your dessert. 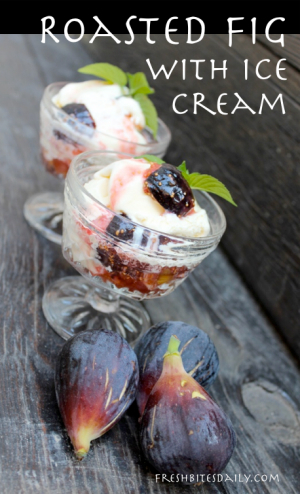 Divide half the figs and sauce evenly among your dessert dishes. Place a scoop of ice cream on top of the fig mixture. Spoon the remaining fig and sauce evenly over the ice cream scoops. Garnish with mint sprigs and serve at once. If you are lucky enough to have a quantity of figs, you could make a large batch of roasted figs. Store them in the refrigerator up to four days. You could enjoy these roasted figs on shortcake with whipped cream, in dessert crepes, over melted brie. Try this recipe once and you will come up with all sorts of great ideas!